It's been a full couple of weeks that I've missed on posts, but I don't think we missed that much. Week 3 was about understanding layouts and how they can affect interaction. The downside to Week 3 and Week 4's modules is that the whole concept of layouts seems like a course in itself. You can have something linear and super scroll-y if you want to create a story. You can craft a single no-scroll with ample area for interaction and simple messaging. Or you can craft a million combinations of something in between. Now that I've at least had a chance to look into the concept of layouts, I'm amazed at how designers don't throw themselves into a wall. This task was daunting and far more complex than I anticipated. 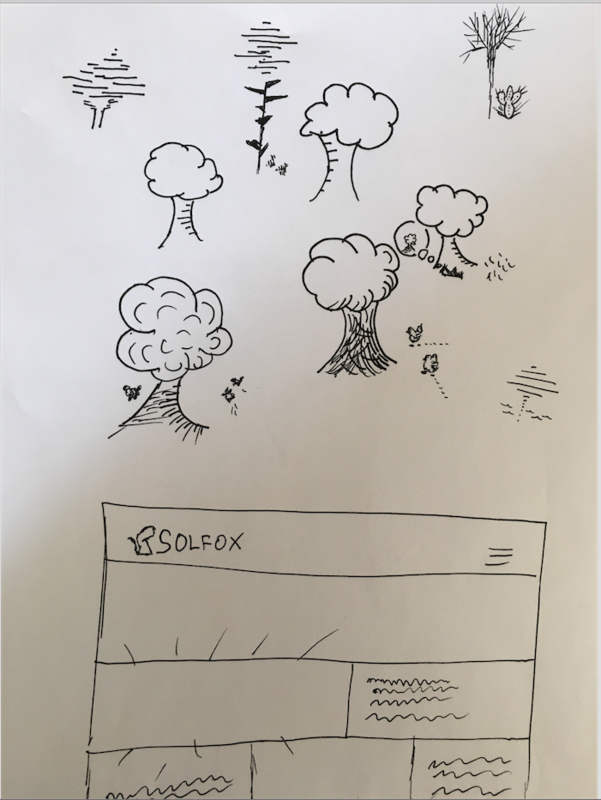 For my task, I wanted to concept something around SolFox, a small startup I'm advising. While the content and the product content hasn't been fleshed out, the theme is using data to discover a deeper story about your customers, without spending much time in doing so. Here are the iterations I came up with. Explanations on rationale below. Before I jumped into grid patterns, I wanted to figure out the feel. As you can clearly see, I'm an incredibly gifted illustrator. 3rd graders everywhere love my work ;) Ok, while learning to draw is somewhere in my set of skills to be gained, for right now, I wanted to draw trees that felt like the design impression I had in mind. Something very direct and object oriented or something more fluid. Since I'm designing for something within the renewable space, I played around with different types of trees to get a better idea for the feel I'm trying to project. I chose a predominantly simple and bold version, but some elements of curve and whimsy. 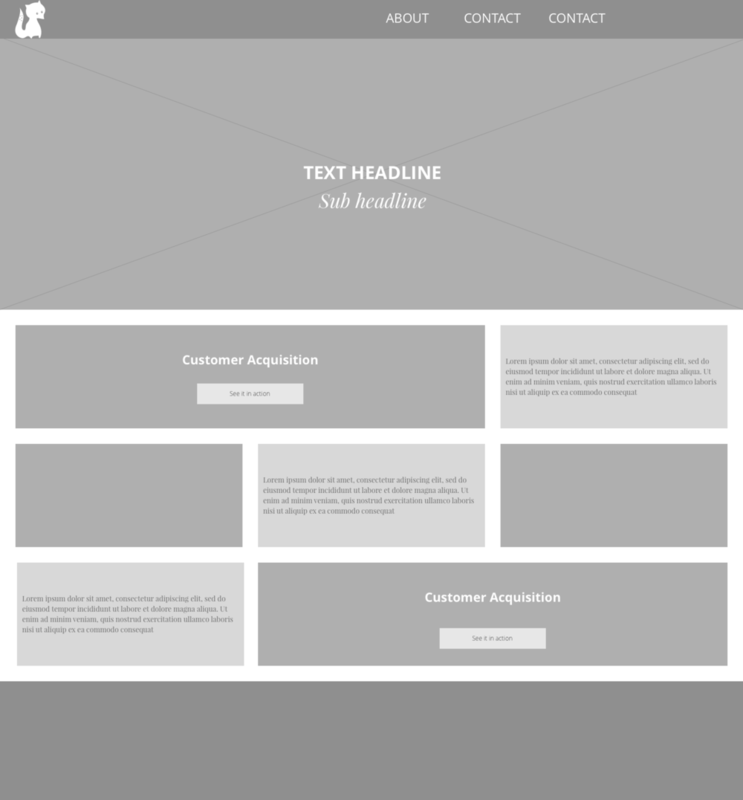 Once I settled on the 'feel', I wanted to find a grid pattern / landing page that was similar to what I was thinking and used that as a baseline reference for what the final product might look like. That's the 2nd image. Next up, fix the spacing & padding. Let's add some 'real' content and see how it all flows. More padding and alignment fixes. Overall thoughts: WIth some pictures, things might look better. But this might get really busy really quickly. The font choices don't seem ideal for this, but I think the layout is the larger issues. If I need to add space for content, a more simple layout should accommodate for that vs. trying to cram it all in from the beginning. Maybe. There's room to explore more, but for next steps I want to start over with something much simpler and cleaner.